Wednesday’s Agency Flight Readiness Review (FRR) has approved a May 14 launch date for STS-132, following a very smooth meeting at the Kennedy Space Center (KSC). 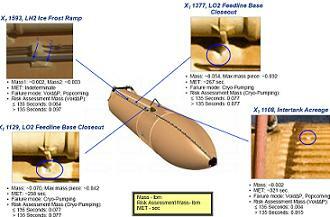 Among the topics discussed was the mitigation efforts on the problem of foam liberation from the External Tank (ET) intertank region, which has been classed as a resounding success, based on the results from STS-131’s tank. A minor issue caused specialist engineers to head to Pad 39A on Wednesday, as they inspected a thermal barrier that will require repair on the left vent door. After ensuring a repair held no “mechanism problems” for the area in question, work will be carried out during the nominal pad flow. Only one Interim Problem Report (IPR) – recorded last week – remains open, as Atlantis continues closeouts for the start of S0007 Launch Countdown operations. “OV-104 / ET-136 / SRB BI-143 / RSRM 111 (Pad A): IPR 132V-0029 (Partial Pressure Oxygen (PPO2) sensor C failure to calibrate) update: The discrepant sensor was replaced. Initial calibration is within tolerance. Following some runtime the calibration will be assessed again,” noted the NASA Test Director (NTD) via processing information (L2). “Orbiter Aft closeout continues. Door installation for flight is planned for Friday. Payload Bay latch guide installation was completed Tuesday. Remote Manipulator System (RMS) elbow camera installation is complete. Extravehicular Mobility Unit (EMU) functional was successfully completed Tuesday night. Final air lock close out is in work. With the Agency FRR sailing through the review – with no dissent on any of the items of interest – Atlantis will make her opening launch attempt on May 14, with the short window closing on May 18 – showing the importance of achieving a smooth pad flow that has held only one contingency day in the bank since rollout. 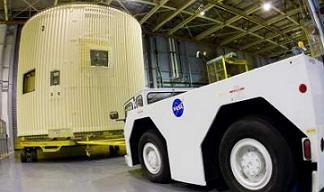 The performance of the External Tank – both ahead of flight and during the ride uphill – is one of the key areas of interest for the Shuttle Program, with not only the primary role of supplying propellant to the three SSMEs (Space Shuttle Main Engines), but also the requirement of avoiding serious liberations of its Thermal Protection System (TPS) foam, which hold the obvious threat of impacting and damaging the orbiter. Massive strides have been made on mitigating foam loss since Return To Flight, with several phases of redesign being carried out on various areas of the tank over recent years – the latest of which flew with STS-131’s ET-135. A sign of the progress made on the tanks can be seen via the report that only five areas of foam loss were recorded on ET-135 – resulting in one of the ‘cleanest’ tanks ever to fly. “Five (5) TPS debris events observed in imagery. All observations consistent with physics-based understanding and process control verification data,” added the FRR presentation, adding that only one area of the intertank liberated during ascent, as opposed to numerous areas – as has been the problem on recent flights. “Post Flight Performance Assessment -Intertank Acreage TPS performance with one Intertank debris event identified during imagery review. Observation not indicative of low bond adhesion failure mode (primer/substrate not exposed). ET-135 performance supports proximate root cause understanding for previous losses (contamination / low adhesion strength). The lack of liberations from the intertank is proof-positive that a mitigation plan – created by engineers tasked with investigating the foam loss events – has worked, following a large effort to investigate the root cause of several flights-worth of multiple liberations from this area of the tank. Firstly, engineers found that the liberations were being caused by contamination making its way on to the structure of the intertank, prior to the application of foam. This in turn reduced the adhesive properties, leading to foam shedding during the aerodynamic stresses of ascent. A change to the production procedures at the Michoud Assembly Facility (MAF) was ordered, following an investigation that found the cleaning process on the intertank was obstructed by platforms used by the technicians tasked with removing all of the dust contamination, prior to the application of foam. This change proved to be highly beneficial for ET-135, as the intertank foam losses were greatly reduced. Further mitigation procedures are in place for ET-136 – in addition to the positive changes made for ET-135 – changes that are in place for the soon to arrive ET-137 (STS-133) and ET-138 (STS-134). “Notable processing change identified for ET-136 processing. Alternate location (Cell Q) used to perform substrate cleaning and TPS application. 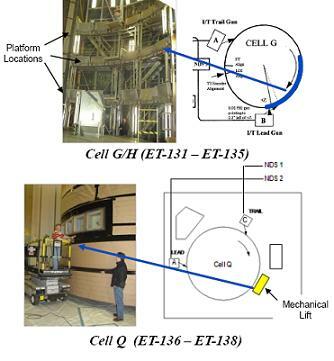 Cell Q used for ETs 136-138 to support production. All other key processing parameters within previous experience. Technicians experience, elapsed time between clean/TPS, and number of primer touch-up increments,” added the FRR presentation. “Cell Q foam delivery system, turn table and environment requirements unchanged. Substrate cleaning process used improved technician access via mechanical lift in Cell Q. Platform obstructions eliminated (majority of previous losses correlate to platforms). Cleaning process and verifications unchanged. Manual solvent wipe with MEK and visual verification (shop and QC). Tank cleaned from top to bottom in vertical paths per panel. Thanks to the performance of STS-131’s ET-135, which backs up both the root cause and success of the subsequent processing changes, confidence is high that the performance of ET-136 will match that of its predecessor. “Potential predicted debris mass < 0.010 lbm (2 indications on LH2 IFR (Ice Frost Ramp) at XT (station) 1205),” the presentation continued, also referencing the back-up checks of continuing plug/pull tests on the tank at the Kennedy Space Center (KSC) to test the adhesive properties of the completed tank. 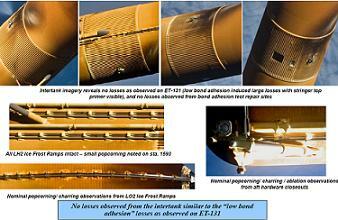 “Bond adhesion tests performed on ET-136 Intertank acreage TPS. Testing performed as process control check in response to bond adhesion failures observed on previous tanks (STS-127, STS-129,and STS-130). Similar testing performed on all tanks since ET-132. 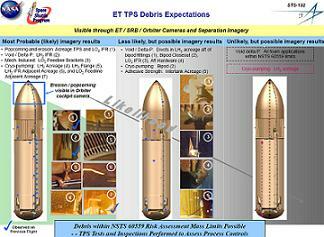 “Intertank TPS performance expectations and flight rationale unchanged from STS-131 / ET-135. On-tank bond adhesion tests provide confidence that global contamination / low adhesion strength is unlikely. Foam loss not observed from bond adhesion test locations on previous tanks. The excellence in mitigating foam loss issues throughout the remainder of the program backs up the aim – noted several times by shuttle managers – that it is their intention to end the program with the cleanest tank in history.